Shipping of next batch is planned for second half of January. If you pre-ordering, please choose one of new products on links above. If you will pre-order this discontinued unit from first batch, we will send you new Pixhawk 2.1 Standard edition. 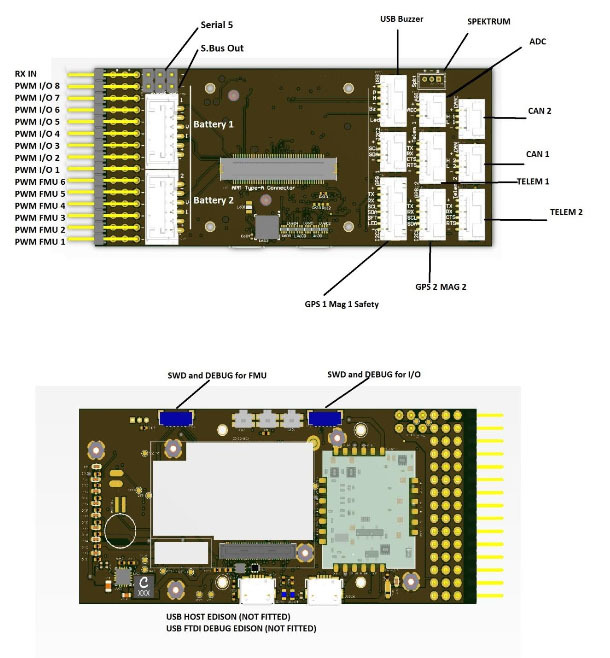 • An integrated, single board / box flight controller. • Sufficient I/O for most applications without expansion. • Increased reliability and reduced integration complexity. • Reduced BoM and manufacturing costs. • All-in-one design with integrated FMU and IO and lots of I/O ports. • Improved manufacturability, designed for simpler mounting and case design. • Separate power supplies for FMU and IO (see power architecture section). • On-board battery backup for FMU and IO SRAM / RTC. • Integration with the standard power brick. • STM32F427; flash 2MiB, RAM 256KiB. • All sensors connected via SPI. • Micro SD interfaces via SDIO. • 14 PWM servo outputs (8 from IO, 6 from FMU). • R/C inputs for CPPM, Spektrum / DSM and S.Bus. • Analogue / PWM RSSI input. • One SPI port (un-buffered, for short cables onlynot recommended for use). • Safety switch / LED. - This is only on the "PRO" carrier board mini carrier board still draws the backup from the servo rail. - This allows for connection of items to either I2C port, potentially allowing two GPS / Mag units to be plugged in without the Mags conflicting. - I physical Hardware ID has been added to the I/O of the Pixhawk2. This needs software to identify the board for debug purposes. This is the only non-software method to tell the two Pixhawks apart. Power monitoring pins are now routed to the I/O chip, these will allow for the logging of power events during an inflight reboot. Brick OK, Backup OK, and FMU 3.3V are all connected to a digital pin on the I/O via a 220Ohm resister.